Big Basin Way from 4th St. to the intersection of Saratoga Ave. and Hwy 9 will be closed from 7:30AM to 10:00AM. Northbound detour is going up Saratoga-Sunnyvale Rd. to Reid Lane (left) to Michaels Ln. (left) Canyon View (quick right) to 4th St. (left) to Springer (right) which will bring you to Big Basin Way. Southbound detour would be taking Springer off Big Basin and following same directions in reverse. Hwy 9 (Saratoga-Los Gatos Rd.) will be closed in the southbound direction from Big Basin Way to Fruitvale Ave. from 6:00AM to 10:30AM. A detour can be made following Saratoga Ave. to Fruitvale Ave. This will bring you back up to Highway 9 (Saratoga-Los Gatos Rd. ) which will have a southbound lane open for traffic. The number two lane (aka slow lane) on Hwy 9 (Saratoga-Los Gatos Rd.) will be closed in the southbound direction from Fruitvale Ave into Los Gatos from 6AM to 10:30AM. You may drive in the number 1 lane (aka fast lane) southbound, but we ask you to proceed with caution and be aware of the runners in the number two lane. When you proceed into Los Gatos, Hwy 9 is closed from Rose Ave. to N. Santa Cruz. 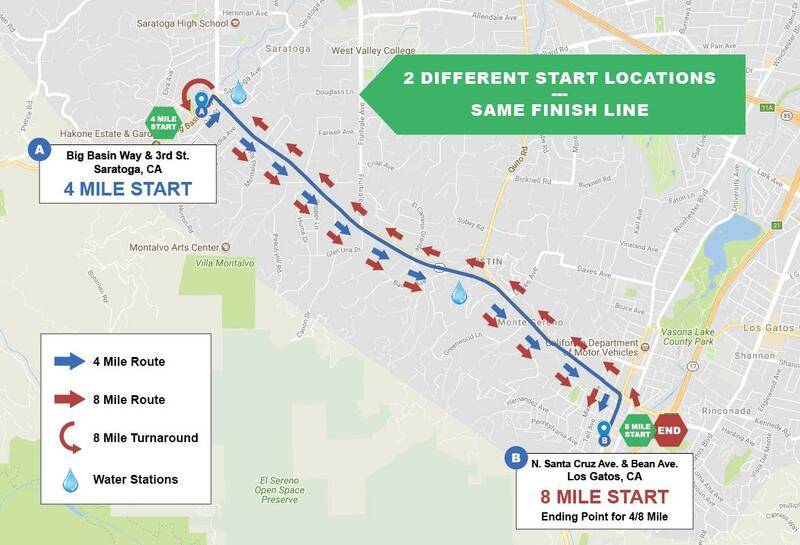 You can quickly get to N. Santa Cruz by turning left on Rose Ave. and right onto Andrews St.
N. Santa Cruz Ave. will be closed from 7AM-11AM from Highway 9 to Main St. However, Main St. in Los Gatos will be open all morning. Residents can maneuver around the race by using Main St. and University Ave. If you live in streets or houses along Hwy 9, we know this event can cause some inconvenience for you. We have course monitors that will allow you to enter Hwy 9 when there is sufficient space between runners for a safe entry. We ask that you respect their instructions and the safety of our race participants. Thank you again for your patience. Please note that proceeds raised from the race go directly back into the community in the form of scholarships, local programs for people of all ages, and community projects. If you have any questions, please do not hesitate to call the race director, Mike Norcia, at (408)823-2022.